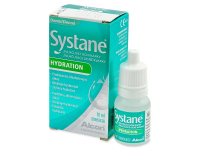 Systane Hydration eye drops provide lasting relief for dry, irritated eyes. Their unique formula helps promote regeneration of damaged cells on the eye's surface, and they are suitable for use with contact lenses. Systane®HYDRATION moisturising eye drops from Alcon feature two polymers that work together to allow damaged cells on the eye's surface to regenerate. Systane®HYDRATION offers long-term protection and greater hydration than hyaluronic acid alone. The combination of HP-guar and hyaluronic acid binds the damaged cells in the corneal epithelium and increases hydration and lubrication to protect the surface of the eye. Besides greater protection, Systane®HYDRATION eye drops also aid the eyes' surface recovery. Systane®HYDRATION drops relieve symptoms of dry eyes by providing temporary relief from burning and irritation. They can be used every day to moisturise and lubricate, even while wearing extended-wear contact lenses. They can be used for 3 months after opening. Are dry or red eyes bothering you? Systane®HYDRATION eye drops protect against dry eye syndrome. They provide additional lubrication for contact lenses, especially in windy or freezing weather conditions and in dusty and dry conditions. They are safe to apply any time the eyes are feeling dry or irritated.